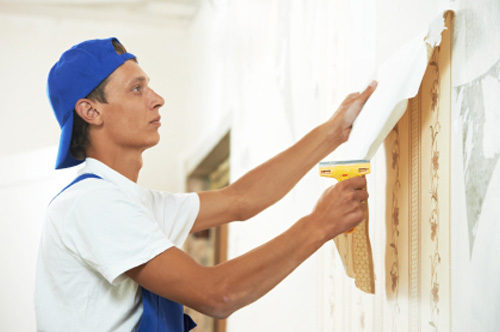 Removing wallpaper on your own can be time-consuming and troublesome. The foremen at Renaissance Painters, however, can complete the project quickly and efficiently, saving you time and money. First, they will remove all electrical outlet plates and anything hanging on your wall. These gaps will be taped off, to prevent any adhesive or solution from dripping into them. Floors will be covered, so no liquid damages them. Wallpaper will be peeled away slowly and carefully. Pulling away too quickly can leave damages to the surface. A steamer or solution may be applied to make the process easier, depending on how the wallpaper was installed. Once removed, anything remaining on the walls will be scraped off by hand. Once the wallpaper has been removed, the foremen will wipe down the walls with tri-sodium phosphate, then water, which will remove any remaining adhesive off the surface. After the walls have dried, any nicks or dents will be plastered up, then sanded down. Your walls are now wallpaper-free, and ready for an all-new decoration. Renaissance Painters takes the hassle and frustration out of wallpaper removal. That’s why Toronto has been choosing this team of wallpaper removers for over 28 years. Call them today at (416) 618-0400, or visit the website at www.renaissancepainters.ca for a free consultaiton!